Eve falls to the ground, in the form of a grotesquely transparent child titan, accompanied by a cigar shaped mother-ship in her descent onto a flowery marsh landscape. 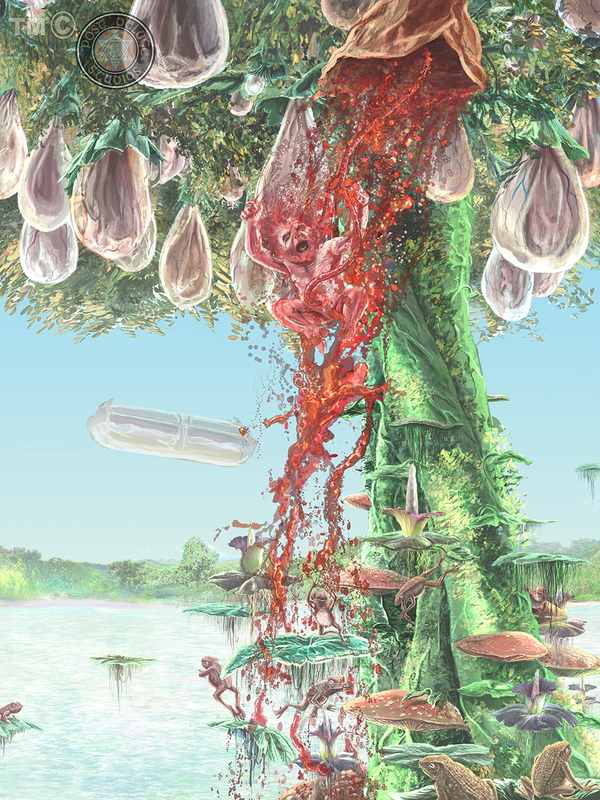 A waterfall of blood and fetal fluid crash down into the aquatic landscape, feeding the giant toads which sit upon giant flower pedals with vital nutrients. It is so humid that vegetation sprouts out of thin air. This land is indeed the place where the spiritual and physical Garden's of Eden meet, in an avatar like fantasy land. Just signed up to this wonderful community! HSC Result 2018 with marksheet will be available here. Hi all. I am jason and new to this forum. I hope we can be friends! I am interested in luxury replica watches and jewerly. I can answer any question about this . there is some thing on your head. OMG! That's why beer makes you drunk! Will be watching this one from behind the couch, Pim.